This page describes the Saferpay JSON application programming interface. Our API is designed to have predictable, resource-oriented URLs and to use HTTP response codes to indicate API errors. We use built-in HTTP features, like HTTP authentication and HTTP verbs, which can be understood by off-the-shelf HTTP clients. JSON will be returned in all responses from the API, including errors. UTF-8 must be used for text encoding (there are restrictions on allowed characters for specific fields though). Id A-Za-z0-9. :-_ Alphanumeric with dot, colon, hyphen and underscore. Boolean true or false Boolean values. Date ISO 8601 Date and Time ISO 8601 format, e.g. 2007-12-24T18:21:25.123Z (UTC) or 2007-12-24T19:21:25.123+01:00 (CET). Max 3 digits in the fractional seconds part. Saferpay supports the mechanism of basic authentication or a client certificate for authentication of a server (host) system. Important: You must use either the Basic Authentication, OR the Client Certificate, but not both! Also make sure, that you do not send any faulty or old certificates, or authentication/accept headers. Otherwise our corporate Firewall will reject the call with a 403-Forbidden status! Furthermore, please note, that some environments do this by default. So even if you didn't implement it, the environment may do it as a default! It may be necessary to check your configuration. This is the default authentication method. Technical users for the JSON API can be created by the merchant in the Saferpay Backoffice under Settings > JSON API basic authentication. The password will not be stored at SIX (only a securely salted hash thereof). There will be no password recovery besides creating a new user / password pair from your Backoffice account. The password must meet some complexity requirements. We suggest using / generating dedicated passwords with a length of 16 alphanumeric characters (up to 32 characters). Alternatively, Saferpay also supports authentication via a client certificate. Important: This feature is only available for Saferpay Business merchants! 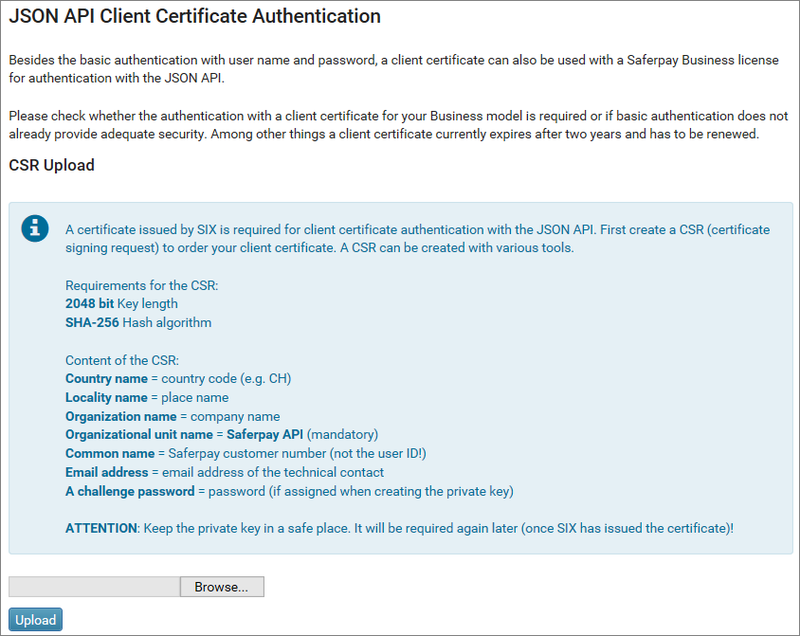 A client certificate for the JSON-API can be ordered in the Saferpay Backoffice under Settings > JSON API client certificate. If you have a Saferpay Business licence, you will find the HTTPS Client Certificate Authentication section under the form for HTTPS Basic Authentication. Generate the CSR as described on the page and import it using the upload button. The signed client certificate will then be downloaded through your browser. For the integration phase, you should visit our test environment! There you can register your personal test account, which you then can use for testing, to try out different functions and for general evaluation. You can find a list of test-cards and other payment means for testing over here! While these Documents are meant as a quick reference and technical specification of the Saferpay JSON-API, the Saferpay Integration Guide contains an in depth explanation about payment-flows, tips and tricks, as well as best practices for those, who want to integrate the JSON-API and its features for the first time. It will also help to understand certain characteristics about the different payment methods we offer, as well as the rules you must follow, when processing vital credit card data and more. The sequential steps of the general integration process are described in our Step-by-step Integration-Manual. In secure server-to-server calls you have to submit a JSON request containing you processing instructions to the defined URLs. The URL and the JSON structure varies depending on the action/resource you want to call. For further details check the description of resources below. Server-to-server calls are a secure way to submit and gather data. Hence, a server-to-server call should always follow after the customer returns back to the shop, to gather information about the outcome of e.g. 3D Secure. Important: Saferpay only supports TLS 1.2 and up, for secure connections. Please make sure, that your system is configured accordingly! More information in our TLS-FAQ. Important: The redirect towards the redirectUrl via http-POST IS NOT supported. You should always use http-GET, unless specifically stated otherwise! Important: The Saferpay-Integration via Pop-Up is not supported, be it for the Payment Page, or the Hosted Forms! However an integration via Lightbox, or similar, is supported! Caution: DO NOT implement a polling-process, to poll for the transaction-data. Respond with the necessary request, at the correct time (e.g. doing the assert only, if the SuccessUrl, or NotifyUrl are called). Saferpay reserves the right to otherwise deactivate, or block your account! //This is an EXAMPLE of the payload-Array. 'OsInfo' => "Windows Server 2013"
//Under Windows (using WAMP or XAMP) it is necessary to manually download and save the necessary SSL-Root certificates! //HTTP-Basic Authentication for the Saferpay JSON-API. If you include the redirect pages into your web-page using an iframe, you can react on size changes of the iframe content by listening to a message event containing the new sizing information. Please note: Depending on the bank, issuer, or payment provider, the page can try to break out of the iframe or lack telling you the actual size of the content. As an additional security feature, you can also grant permissions to specific IPs. This way you can control the API access even further in connection with the authentication credentials. To do so, you need to log into the Saferpay Backoffice, for either production or test, then go under Settings > IP permissions and enter the IP, or IP range of your network/server! Note: This feature is entirely optional and only supports IPv4 addresses only! Take the correct request URL and add it to the base URL. You can find it on the right side of the request-specification. Successfully completed requests are confirmed with an http status code of 200 and contain the appropriate response message in the body. If the request could not be completed successfully, this is indicated by a status code of 400 or higher and – if possible (some errors are generated by the web server itself, or the web application firewall and are thus outside of our control) – an error message stating the reason of the failure is included in the body of the response. The presence of an error message as specified in this document can be derived from the content type: if it’s application/json, then there is an error message present. Info: The API timeout for requests should be 100 seconds! After that, a connection should be closed. Also, no further actions should be taken, until the request is answered or runs into a timeout, to prevent unwanted behavior. Contains general informations about the response. What can be done to resolve the error? Possible values: ABORT, OTHER_MEANS, RETRY, RETRY_LATER. Name / id of the error. These names will not change, so you may parse these and attach your logic to the ErrorName. Description of the error. The contents of this element might change without notice, so do not parse it. More details, if available. Contents may change at any time, so don’t parse it. "PaymentMeans.BankAccount.IBAN: The field IBAN is invalid." ABORT Do not retry this request. It will never succeed. RETRY Request is valid and understood, but can't be processed at this time. This request can be retried. RETRY_LATER This request can be retried later after certain state/ error condition has been changed. OTHER_MEANS Special case of retry. Please provide another means of payment. ACTION_NOT_SUPPORTED The requested action is not supported in the given context or the action can't be executed with the request data. ALIAS_INVALID The alias is not known or already used (in case of registration). AMOUNT_INVALID The amount does not adhere to the restrictions for this action. E.g. it might be exceeding the allowed capture amount. AUTHENTICATION_FAILED Wrong password, wrong client certificate, invalid token, wrong HMAC. CARD_CHECK_FAILED Invalid card number or cvc (this is only returned for the SIX-internal chard check feature for Alias/InsertDirect). COMMUNICATION_FAILED The communication to the processor failed. COMMUNICATION_TIMEOUT Saferpay did not receive a response from the external system in time. It’s possible that an authorization was created, but Saferpay is not able to know this. Solution: Check with the acquirer if there is an authorization which needs to be canceled. CONDITION_NOT_SATISFIED The condition which was defined in the request could not be satisfied. CURRENCY_INVALID Currency does not match referenced transaction currency. NO_CONTRACT No contract available for the brand / currency combination. Solution: Use another card or change the currency to match an existing contract or have the currency activated for the contract. NO_CREDITS_AVAILABLE No more credits available for this account. 3DS_AUTHENTICATION_FAILED 3D-secure authentication failed – the transaction must be aborted. TOKEN_EXPIRED The token is expired. Solution: Create a new token. TRANSACTION_ABORTED The transaction was aborted by the payer. TRANSACTION_DECLINED Declined by the processor. Solution: Use another card or check details. TRANSACTION_NOT_STARTED The transaction was not started by the payer. Therefore, no final result for the transaction is available. The Payment Page Interface provides a simple and easy integration of Saferpay into your web shop, mobile app or other applications without the need to implement a user interface for card data entry. The Saferpay Payment Page can be used with a Saferpay eCommerce license as well as with a Saferpay Business license. It allows the processing of all payment methods that are available with Saferpay. Once integrated, more payment methods can be activated at any time and without major adjustments. Important Note: If you have trouble understanding the transaction flow with the Payment Page in its detail, you may want to read our Saferpay Integration guide, which offers an in depth explanation on how to integrate the Payment Page, optional features, best practices and more. Initializes the Payment and generates the RedirectUrl for the Payment Page. Return to ReturnUrl depending on the outcome of the transaction. The ReturnUrls are defined in step 1! Gathers all the information about the payment, like LiabilityShift through 3D Secure and more, using the Token, gathered in step 1! General information about the request. This parameter let you define your payment page config (PPConfig) by name. If this parameters is not set, your default PPConfig will be applied if available. When the PPConfig can't be found (e.g. wrong name), the Saferpay basic style will be applied to the payment page. Used to restrict the means of payment which are available to the payer for this transaction. If only one payment method id is set, the payment selection step will be skipped. Possible values: ALIPAY, AMEX, BANCONTACT, BONUS, DINERS, DIRECTDEBIT, EPRZELEWY, EPS, GIROPAY, IDEAL, INVOICE, JCB, MAESTRO, MASTERCARD, MYONE, PAYPAL, PAYDIREKT, POSTCARD, POSTFINANCE, SAFERPAYTEST, SOFORT, TWINT, UNIONPAY, VISA, VPAY. Used to control if wallets should be enabled on the payment selection page and to go directly to the given wallet (if exactly one wallet is filled and PaymentMethods is not set). These Urls are used by Saferpay to redirect the shopper back to the merchant shop. You may add query string parameters to identify your session, but please be aware that the shopper could modify these parameters inside the browser! The whole url including query string parameters should be as short as possible to prevent issues with specific browsers and must not exceed 2000 characters. Note: you should not add sensitive data to the query string, as its contents is plainly visible inside the browser and will be logged by our web servers. Used to have the payer enter his billing address in the payment process. Used to have the payer enter his delivery address in the payment process. "Fail": "[your shop payment fail url]"
Expiration date / time of the generated token in ISO 8601 format in UTC. After this time, the token won’t be accepted for any further action. Redirecturl for the payment page transaction. Simply add this to a "Pay Now"-button or do an automatic redirect. "RequestId": "Id of the request"
Call this function to safely check the status of the transaction from your server. Depending on the payment provider, the resulting transaction may either be an authorization or may already be captured (meaning the financial flow was already triggered). This will be visible in the status of the transaction container returned in the response. If the transaction failed (the payer was redirected to the Fail url or he manipulated the return url), an error response with an http status code 400 or higher containing an error message will be returned providing some information on the transaction failure. Token returned by initial call. This chapter will give you a simple overview about the general transaction flow, when using the Transaction Interface. Important Note: The Transaction Interface offers all sorts of options to perform transactions. This flow only describes the general flow. Furthermore, you may want to read our Saferpay Integration guide, which offers an in depth explanation on how to integrate the Transaction Interface, optional features, best practices and more. Initializes the Payment and generates the RedirectUrl for the iFrame Integration. Open the RedirectUrl inside an HTML-iFrame, to show the hosted card entry form! Return to Return Url depending on the outcome of the 3D Secure procedure. The ReturnUrls are defined in step 1! Authorizes the card, which has been gathered in step 2. Up until now, no transaction has been made! This method may be used to start a transaction which may involve either DCC and / or 3d-secure. Warning: Only PCI certified merchants may submit the card-data directly, or use their own HTML form! Click here for more information! Means of payment (either card data or a reference to a previously stored card). Important: Only fully PCI certified merchants may directly use the card data. If your system is not explicitly certified to handle card data directly, then use the Saferpay Secure Card Data-Storage instead. If the customer enters a new card, you may want to use the Saferpay Hosted Register Form to capture the card data through Saferpay. Wallet system to be used for the transaction (this cannot be combined with PaymentMeans above). Possible values: AMEX, BANCONTACT, BONUS, DINERS, DIRECTDEBIT, JCB, MAESTRO, MASTERCARD, MYONE, SAFERPAYTEST, UNIONPAY, VISA, VPAY. Additional values may be accepted but are ignored. "CssUrl": "[your shop css url]"
Indicates if liability shift to issuer is possible or not. Not present if PaymentMeans container was not present in InitializeTransaction request. True, if liability shift to issuer is possible, false if not. Mandatory if RedirectRequired is true. Contains the URL for the redirect to use for example the Saferpay hosted register form. This function may be called to authorize a transaction which was started by a call to Transaction/Initialize. (liability shift may still be declined with the authorization though). This condition will be ignored for brands which Saferpay does not offer 3d-secure for. If left out, the authorization will be done if allowed, but possibly without liability shift to the issuer. See the specific result codes in the response message. Controls whether the given means of payment should be stored inside the saferpay Secure Card Data storage. Information about the Secure Card Data registration outcome. This method may be used to query the payment means and payer data (address) after initialize and wallet redirect. This function may be called to retrieve information on the means of payment which was entered / chosen by the payer after the browser is redirected to the successUrl. For MasterPass, the address the payer has selected in his wallet is returned as well as the RedirectUrl for DCC if DCC was skipped by the EnableAmountAdjustment attribute in Initialize. Available if DCC may be performed. This method may be used to adjust the amount after query payment means. This function allows a change of the authorization amount which was originally set by Initialize. For the time being, this is only allowed for MasterPass business integration scenario and requires a flag having been set in the Initialize call. This function may be used to directly authorize transactions which do not require a redirect of the customer (e.g. direct debit or recurring transactions based on a previously registered alias). Information on the means of payment. Important: Only fully PCI certified merchants may directly use the card data. If your system is not explicitly certified to handle card data directly, then use the Saferpay Secure Card Data-Storage instead. If the customer enters a new card, you may want to use the Saferpay Hosted Register Form to capture the card data through Saferpay. This method may be used to perform follow-up authorizations to an earlier transaction. At this time, the referenced (initial) transaction must have been performed setting either the recurring or installment option. Exactly one element must be set. This method may be used to finalize previously authorized transactions and refunds. Optional pending notification capture options for Paydirekt transactions. CaptureId of the created capture. Must be stored for later reference (eg refund). Date and time of capture. Not set if the capture state is pending. Optional infos for invoice based payments. This method may be used to capture multiple parts of an authorized transaction. MultipartCapture is available for SIX Acquiring contracts only! Your live merchant-account needs to be configured, in order to support Multipart Captures, or the request will fail! No MultipartCapture request should be sent before receiving the response of a preceeding request (i.e. no parallel calls are allowed). The sum of multipart captures must not exceed the authorized amount. A unique OrderPartId must be used for each request. 'PARTIAL' if more captures should be possible later on, 'FINAL' if no more captures will be done on this authorization. Must be unique. It identifies each individual step and is especially important for follow-up actions such as refund. Id of the referenced transaction. OrderId of the referenced transaction. If present. This method may be used to finalize a transaction having one or more partial captures (i.e. marks the end of partial captures). This method may be called to refund a previous transaction. Reference to the capture you want to refund. This method may be used to inquire the status and further information of pending refunds. Attention: This method is only supported for pending refunds. A pending refund is only applicable for paydirekt transactions at the moment. This method may be called to refund an amount to the given means of payment (not supported for all means of payment) without referencing a previous transaction. This might be the case if the original transaction was done with a card which is not valid any more. Information on the means of payment. Important: Only fully PCI certified merchants may directly use the card data. If your system is not explicitly certified to handle card data directly, then use the Saferpay Secure Card Data-Storage instead. If the customer enters a new card, you may want to use the Saferpay Hosted Register Form to capture the card data through Saferpay. This method may be used to cancel previously authorized transactions and refunds. Reference to transaction to be canceled. Date and time of cancel. WARNING: This feature is deprecated and replaced by the Payment Page. Please use the parameter PaymentMethods to directly select the desired 3rd party provider! Possible values: PAYPAL, POSTCARD, POSTFINANCE. This function may be used to insert an alias without knowledge about the card details. Therefore a redirect of the customer is required. Possible values: CARD, BANK_ACCOUNT, POSTFINANCE, TWINT. Urls which are to be used to redirect the payer back to the shop. Custom styling resource for the Hosted Register form. Language used for displaying forms. Parameters for checking the means of payment before registering. IMPORTANT NOTE: The Check function is only available for SIX Payment Services VISA and Mastercard acquiring contracts! "Fail": "[your shop alias registration fail url]"
Saferpay-Url to post the form data to. This method may be used to inquire the Alias Id and further information after a successful Alias Insert call. Caution: Please DO NOT use the AssertInsert request for polling. You should always await the reception of the SuccessUrl. Information about the registered alias. This method may be used to insert an alias directly with card-data collected by using your own HTML form. Warning: Only respectively PCI certified merchants may submit the card-data directly, or use their own HTML form! Click here for more information! This method may be used to delete previously inserted aliases. The Alias you want to delete. This value is case-insensitive. Note: If you want to trigger the batch-close via API, make sure, to turn the automatic batch off. Please log into the Saferpay Backoffice. Go to Settings => Terminals and select the desired terminal out of the list. Turn off the Automatic closure. This function may be used to create an alias by providing a SixTransactionReference. This function may be used to acquire an authorized transaction by providing a SixTransactionReference. This transaction can then be captured or canceled. This request allows to acquire an OmniChannel transaction. Unambiguous order identifier defined by the merchant/ shop. This identifier might be used as reference later on. "OrderId": "Id of the order"
This response returns an acquired OmniChannel transaction. Version number of the interface specification. For new implementations, the newest Version should be used. Saferpay customer id. Part of the Saferpay AccountID, which has the following format: 123123-12345678. The first Value is your CustomerID. Unique id generated by merchant. Must not change for subsequently resent requests. 0 if the request is sent for the first time, >=1 if it is a repetition. Version number of the interface specification. Id of the referenced capture. Unambiguous OrderId of the referenced transaction. OrderPartId of the referenced capture if a partial capture should be referenced and the CaptureId/TransactionId of the partial capture is not available. Possible values: MALE, FEMALE, COMPANY. Possible values: AG, GmbH, Misc. The payer's street, second line. Only use this, if you need two lines. It may not be supported by all acquirers. Specifies whether to show the address form or not. List of fields which the payer must enter to proceed with the payment. Possible values: CITY, COMPANY, COUNTRY, EMAIL, FIRSTNAME, LASTNAME, PHONE, SALUTATION, STATE, STREET, ZIP. Id / name of the alias. This value is case-insensitive. Verification code (CVV, CVC) if applicable (if the alias referenced is a card). Number of days this card is stored within Saferpay. Minimum 1 day, maximum 1600 days. Type of check to perform. Saferpay Terminal-Id to be used for checking. The result of the online check. Example: Online card check was successful. Amount in minor unit (CHF 1.00 ⇒ Value=100). Only Integer values will be accepted! International Bank Account Number in electronical format (without spaces). Bank Identifier Code without spaces. Unambiguous order identifier defined by the merchant / shop. This identifier might be used as reference later on. A human readable description provided by the merchant that can be displayed in web sites. Text which will be printed on payer's debit note. Supported by SIX Acquiring. No guarantee that it will show up on the payer's debit note, because his bank has to support it too. Please note that maximum allowed characters are rarely supported. It's usually around 10-12. Name of the Brand (Visa, Mastercard, an so on – might change over time, only use for display, never for parsing). Only use it for display, never for parsing and/or mapping! Use PaymentMethod instead. This parameter let you customize the holder name field on the card entry form. Per default, a mandatory holder name field is shown. The HashValue, if the hash generation is configured for the customer. The unique Mandate reference, required for german direct debit payments. Creditor id, required for german direct debit payments. Id to identify the fraud free request. Indicates whether liability shift to Fraugster is possible or not. True, if liability shift to issuer is possible, false if not (only SSL transaction). Fraud score, indicates the risk of a transaction being fraudulent. Indicate the issues with the transaction. Error message which indicates why FraudFree could not process the request. If set to true, the authorization may later be referenced for installment followup transactions. The id of the marketplace submerchant on whose behalf the capture or refund capture is being made. The marketplace fee that will be charged from the marketplace to the submerchant. The properties Fee and FeeRefund cannot be used simultaneously. The fee amount that will be refunded from the marketplace to the submerchant. Email address to which a confirmation email will be sent to the merchant after successful authorizations. Email address to which a confirmation email will be sent to the payer after successful authorizations. Url to which Saferpay will send the asynchronous confirmation for the transaction. Supported schemes are http and https. You also have to make sure to support the GET-method. IPv4 address of the card holder / payer if available. Dotted quad notation. Language to be used if Saferpay displays something to the payer. The location the IpAddress, if available. This might be a valid country code or a special value for 'non-country' locations (anonymous proxy, satellite phone, ...). Mandate reference of the payment. Needed for German direct debits (ELV) only. The value has to be unique. Recurring options – cannot be combined with Installment. Installment options – cannot be combined with Recurring. Alias data if payment means was registered with Secure Card Data before. Bank account data for direct debit transactions. Used to flag the transaction as a Pre-Athorization. This type of transaction is only supported with the following Acquiring: SIX Payment Services, B+S Card Service, ConCardis, Airplus and -after an agreement- with American Express. A human readable description provided by the merchant that will be displayed in Payment Page. Possible values: AUTHORIZED, CAPTURED, PENDING. Unique Saferpay transaction id. Used to reference the transaction in any further step. Amount (currency, value, etc.) that has been authorized. Email which will be notified by Saferpay if an action could not be completed synchronously and was reported with a ‘pending’ state (eg CAPTURE_PENDING). Up until now, this is only applicable for Paydirekt transactions. Url which is called by Saferpay if an action could not be completed synchronously and was reported with a ‘pending’ state (eg CAPTURE_PENDING). Up until now, this is only applicable for Paydirekt transactions. If set to true, the authorization may later be referenced for recurring followup transactions. Redirect-URL. Used to either redirect the payer or let him enter his means of payment. True, if the given URL must be used as the target of a form containing card data entered by the card holder. If ‘false’, either a GET or POST redirect without additional data may be performed. Reference defined by the merchant. Id generator to be used by Saferpay. Possible values: MANUAL, RANDOM, RANDOM_UNIQUE. Alias id to be used for registration if not generated by Saferpay. Mandatory if IdGenerator is 'MANUAL'. This value is case-insensitive. Number of days this card is to be stored within Saferpay. If not filled, the standard lifetime will be used. Name / id of the error. Return url for transaction aborted by the payer. Custom styling resource (url) which will be referenced in web pages displayed by Saferpay to apply your custom styling. This file must be hosted on a SSL/TLS secured web server (the url must start with https://). When enabled, then ContentSecurity/SAQ-A is requested, which leads to the CSS being loaded from the saferpay server. This parameter let you customize the appearance of the displayed payment pages. Per default a lightweight responsive styling will be applied. If you don't want any styling use 'NONE'. Possible values: DEFAULT, SIX, NONE. Indicates, whether the payer has successfuly authenticated him/herself or not. Indicates whether liability shift to issuer is possible or not. Not present if PaymentMeans container was not present in Initialize request. True, if liability shift to issuer is possible, false if not (only SSL transaction). Please note, that the authentification can be true, but the liabilityshift is false. The issuer has the right to deny the liabiliy shift during the authorization. You can continue to capture the payment here, but we recommend to cancel unsecure payments. BASE64 encoded value, given by the MPI. References the 3D Secure process. The type of the wallet. May be used to restrict the brands which should be allowed. If not sent, we use all brands configured on this terminal. Have the payer select a delivery address in his wallet. If not sent, no address is obtained from wallet. This option is very specific for the MasterPass business scenario where the amount may be adjusted after the redirect to MasterPass and QueryPaymentMeans to allow for changes in shipping costs. If this is set to true, DCC will not be done right away (but may be done later with an additional redirect). DON’T USE THIS IF YOU’RE NOT SURE – IT’S PROBABLY NOT WHAT YOU WANT!